*1 small bag wild greens per serving, you can also mix in some arugula, *baby spinach, *kale, etc. DIRECTIONS: wash wild greens if not using a pre-washed mix and arrange on a large dinner plate. Using a pre-packaged, pre-washed Spring or Fresh Herb mix saves time. 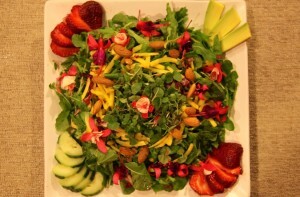 You can also mix arugula, baby spinach, mustard greens, chopped kale, fresh chopped herbs, etc. Peel avocado and using 1/4th of the avocado slice it into thin strips. Arrange on one corner of the plate. Wash cucumber, strawberries, and carrot. Cut a strip of skin away along the length of the cucumber on 4 sides at equal distances apart. To get them even, start by cutting one strip of skin away, then cut a second strip on the opposite side. Next, cut a strip between each of the 2 peeled sections. For each serving, slice 1/4th of the cucumber in circles then cut in half and arrange on opposite corner of the plate from the avocado. Cut out the strawberry leaves at the top. Slice strawberry from the top down to the bottom, without cutting all the way through the strawberry so pieces are all connected. Spread slices like a fan and place on corners of plate opposite the avocado and cucumber. Wash and peel the carrot. With a cheese grater or food processor, shred the carrot. Place the carrot shreds in the center of the bed of lettuce. Wash sprouts and place a small circle of sprouts on top of the bed of carrots. Wash edible flowers and place around the salad, along with the raw nuts. Top with champagne vinaigrette, either made from scratch or to save time buy a no-fat or low-fat version and enjoy! DIRECTIONS: Combine all ingredients in a blender or food processor and blend until smooth. Or use a large bowl to whisk all ingredients, except for oil, together until well blended. Slowly whisk in the olive oil until the dressing is emulsified. EDIBLE FLOWER PETALS - you can grow your own! You can use the flowers of edible herbs including borage and pineapple sage, as well as flower petals from the following: Carnation, Dianthus a.k.a. Pinks, Clover, Hibiscus, Impatien, Lilac, Marigold, Nasturtium, Pansy, Rose (remove bitter white portion), Squash Blossoms, Viola, and Violets. Only eat the petals of edible flowers. Never eat the pollen, allergic reaction may occur. 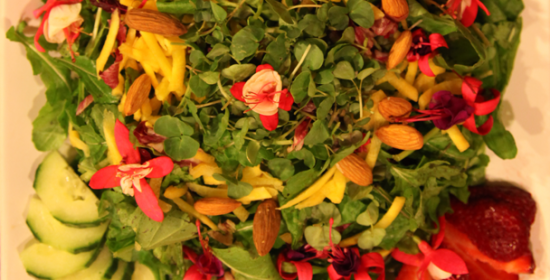 Try growing your own edible flowers…it’s fun! DO NOT EAT: azalea, crocus, daffodil, foxglove, lily of the valley, jack-in-the-pulpit, oleander, rhododendron, or wisteria. *HEALTHY HINTS & TIPS: These items are on the 2012 “Dirty Dozen” list of most heavily sprayed produce, please buy organic or substitute for other kinds of produce not on the list. Try to use dark green and purple greens that are flavorful. Iceberg lettuce is devoid of nutrients. The deeper green or purple of the lettuce the more nutritious it is. Try to buy locally grown, organic greens.